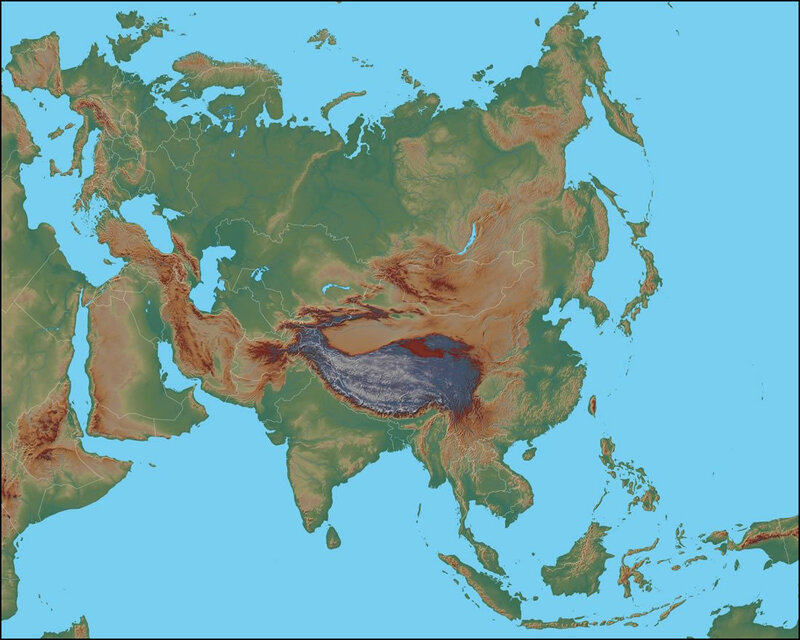 The map above reveals the physical landscape of the Asian Continent. Important mountainous areas include the Zagros Mountains and Elburz Mountains of Iran; the Caucasus Mountains that separate Georgia and Azerbaijan from Russia; the Ural Mountains which most physical geographers use as the dividing line between Europe and Asia; the Tian Shan of central Asia; the Altay Mountains of Mongolia; the Sayon Mountains of Russia; the Cherskiy Range, Kolyma Range, Chukchi Range, Koryak Range, Central Range, Verkhoyansk Range, Dzhugdzhur Range and Sikhote Alin Range of eastern Russia; the Western Ghats of India;, the Arakan Yoma of Burma; the Annam Cordillera of Vietnam; the Himalaya Range and the Barisan Mountains of Indonesia. Numerous bodies of water surround the continent. These include: The Gulf of Oman, the Arabian Sea, the Laccadive Sea, the Bay of Bengal, the Andaman Sea, the Gulf of Thailand, the South China Sea, the Java Sea, the Banda Sea, the East China Sea, Yellow Sea, Sea of Japan, Sea of Okhotsk, Bering Sea, East Siberian Sea, Lapter Sea, Kara Sea, and Barents Sea.